A former Marine accused of stabbing four homeless men to death in Orange County has died while in custody, authorities said. Itzcoatl Ocampo was found sick in his cell Wednesday evening and transported to a hospital in Santa Ana, according to Lt. Jeff Hallock with the Orange County Sheriff’s Department. Ocampo died Thursday afternoon around 1:30 p.m. Authorities said Friday in a press release that Ocampo was shaking and vomitting in his single-man cell. A cause of death has not yet been determined, but his autopsy is tentatively scheduled for early next week. Toxicology results will not be available for several weeks, officials said. 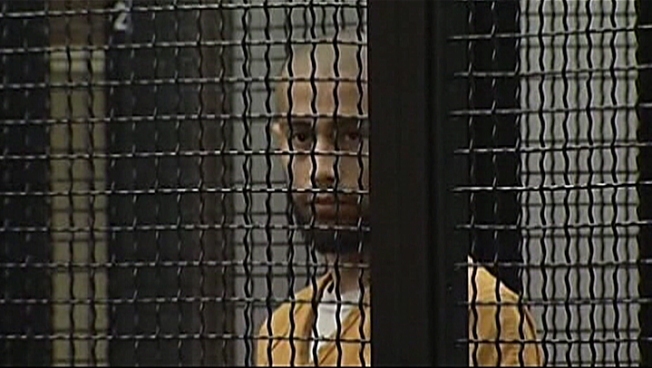 Ocampo was behind bars accused of killing four homeless men and a mother and son in a serial “thrill-kill” spree that set a community on edge for months. He was arrested Jan. 13, 2012. A friend of Ocampo’s, Eder Herrera, was initially arrested in connection with the slayings, but released when DNA evidence linked Ocampo to the crimes, prosecutors said. Orange County District Attorney Tony Rackauckas said Ocampo preyed on homeless men because of their vulnerability. The first victim, James McGillivray, 53, was attacked as he slept outside a Placentia shopping center on Dec. 20, 2011. The body of 53-year-old Lloyd Middaugh was found on a Santa Ana river trail on Dec. 27, 2011; on Dec. 30, Paulus Cornelius Smit was found dead behind a Yorba Linda library. The last slaying happened Jan. 13, 2012, when John Berry was stabbed outside an Anaheim Carl’s Jr. Witnesses saw the slaying, chased Ocampo away and notified police who caught him after a search though a mobile home park in Yorba Linda, police said. Ocampo also faced charges in the Oct. 25 stabbing deaths of the mother and brother of a childhood friend -- Raquel Estrada, 53, and Juan Herrera, 34.